One of the biggest frustrations I hear from my fellow declutters is the neverending piles covering every surface of their homes. I get it, even I have to sleep with one eye open when it comes to this type of clutter. Surface clutter is a force of its own. Empty counters are like a magnet calling for items to flock to its shiny surface. You start out neat and tidy and before the week is through you have piles of randomness all over your tables and counters. If you are here to conquer surface clutter then read on good friends, I’ve got some tips for you! There is no magic wand to stopping surface clutter. It’s actually quite easy. And there is more than one plan of attack for you to pick from. How awesome is that! How to conquer surface clutter. Tip #1 A place for everything and everything in its place. I know, probably not what you wanted to hear but listen. If you have a home for your things then they will not end up on your counters, right? Our grandmothers were definitely on to something. Have a home for everything so you know where they are when you need them and after you are through using them put them away. Ta-da! No more surface clutter. Tip #2 Put the piles in baskets to deal with later. The problem with tip #1 is not all of our things actually have a home. So what then? That is where this amazingly simple basket tip swoops in to save the day. I have a basket in every room of my home. Into that basket goes any items that either need put away and I am just too lazy to do it right now (ha, full disclosure!) or items that simply do not have a home yet. These are some of my favorite baskets and look great in any room. The most important part of this plan is to make sure you do not ignore these baskets. Set a day right now and make that basket day. So, let’s say you choose Friday as your basket day, well great. That is the day you go through every basket and put away any items that have a definite home. The remaining items (those without a home) can be dealt with now by finding a home for them or dealt with later on your next basket day. As you get better at organizing you will find it easier to choose homes that make sense for each item. Tip #3 Keep clutter, clutter. Let’s get real. Clutter should never include these four items. Clothing, dishes, toys, or trash. If you look around your home right now and you see any of these items, get up and take care of them. I promise you it should not take longer than a few minutes to gather up dirty clothes and toss them in the laundry room, dirty dishes and put them in the sink, toys into the kid’s toy box, and trash in the trash can. From here on in those items should be put where they belong and nowhere else. Listen it’s easier to do it along the way rather than spending the time to do it after it builds up. 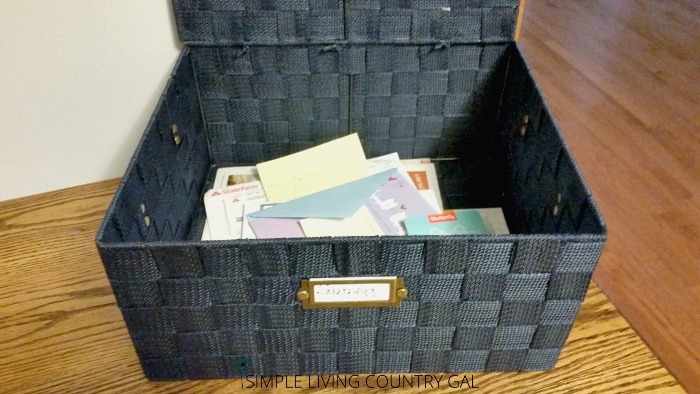 Make this the next habit you instill and watch your future clutter issue slowly disappear. Because after all, you can clean it up and put it all away but if you don’t change your habits you will be right back where you started. Ninja tip: Laundry room too far away? Use these large baskets to corral clothes and keep your rooms neat and tidy! Tip#4 The never-ending paper clutter. This beast can be a bit tricky to tame. When you are constantly getting hit with more and more paper every single day how on earth are you supposed to keep up with it? As soon as a single piece of paper comes into your home you have 3 decisions to make. When you have a paper you need to deal with but not at this moment, what do you do? You put it on the nearest table or counter, right? Sure you do, that is exactly what I used to do. The problem is before you know it that important paper gets shuffled or covered or lost completely by all the other things laying about. What if instead, you had a spot to put all of these papers that need your attention but not this very second? This tip was given to me by one of my readers and it is by far my favorite decluttering tip EVER and will help you conquer surface clutter forever! I have a basket in my office that is nice and big and bonus…has a lid! Oh, I just love hidden clutter! Haha! You can find my favorite basket here. Each day as paper comes into my home I will put papers that need my attention in that basket. Then on Sundays, I will spend some time on my comfy couch with my basket, pen, and stack of post-it notes. I will go through every single piece of paper and either take care of it now or make notes on a post-it and schedule that task on my planner for the upcoming week. Since I have implemented the Sunday Basket I have removed 90% of my paper clutter and cleared off just about every surface in my home. Try it, I promise….you will like it!! So, let’s do a quick recap on how to conquer surface clutter. #1. Have a home for your things and put them away as soon as you are done with them. #2. 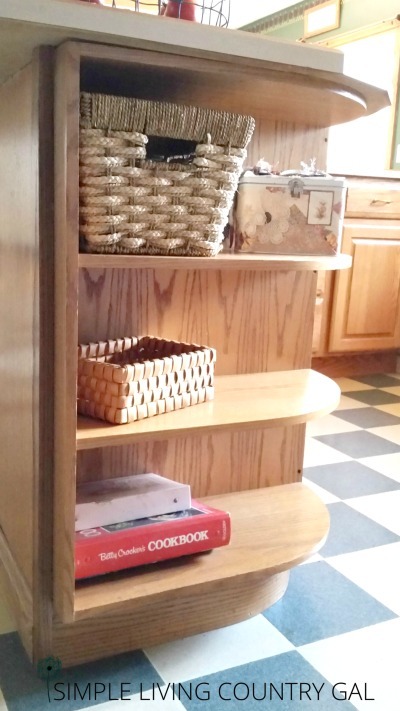 Use baskets in each room to hold your clutter until later. #3. Always take care of clothes, dishes, toys, and trash right away. #4. Use a Sunday Basket to eliminate all paper clutter and never miss a bill payment again! When you have a plan for clutter it really helps to see things in a different light. The things you use the most must have a home and so they are no longer lost in a pile and priority is given to what is important. Have a plan and stick to it so before you know it clutter is a thing of the past. 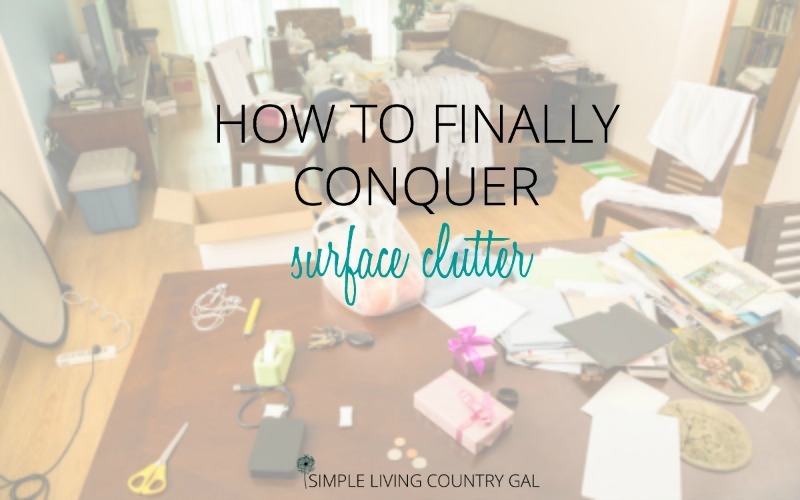 Let’s conquer that surface clutter!! I don’t comment often on blog posts and find many of the same tips online but this was a really well written and unique post on dealing with clutter. I really loved the idea of having a basket in each room! I generally keep a prettttttty tidy house (as much as one can with two toddlers) but there is always that one (or two) piles in each room. Going to try this out and check out some more of your blog! I am so glad you enjoyed my post, yep…I am all about simple! If it’s not simple I won’t do it. Hey, kudos to you keeping a neat house with toddlers!